The THIRD Law of Success is Self-Confidence! You need CONFIDENCE to move forward towards your Definite Chief Aim. Self-Confidence comes from believing in yourself and knowing your worth. What are some of the ways that you can develop Self-Confidence? Napoleon Hill recommends Auto-Suggestion, which is similar to what is currently widely known as affirmations. In other words, you repeatedly tell yourself positive statements to increase your belief in yourself. Repetition goes a long way to changing subconscious beliefs you that are keeping you from your own greatness. In the Law of Success, as well as in Think and Grow Rich, Napoleon Hill suggests that you read his Self-Confidence Formula every day. A lack of self-confidence often comes from having fears. When you realize that how you think influences what you attract into your life, you realize that having fears are a sure way to bring what you fear into your life. Therefore, it is important to acknowledge the fear and then think about what you want instead, and how you can go about getting it. One of the best ways to develop self-confidence is to remember a time in your life when you felt completely confident and on top of your game. Visualize that moment, feel it fully, be in it again, and let it fill you. Then anchor the feeling by grabbing your wrist. When you need confidence in any situation, you can just grab your wrist again and be in that state again. 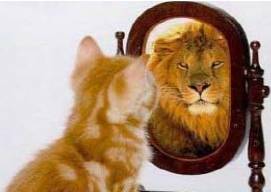 Practice this often, and you will find that you can be that lion in the mirror!